LONDON (AFP) - The 10-storey building may look like a hotel, but it is thought to be the world‘s biggest large-scale house-share, offering modest rooms and upscale services for hundreds of young adults caught in London’s housing crisis. 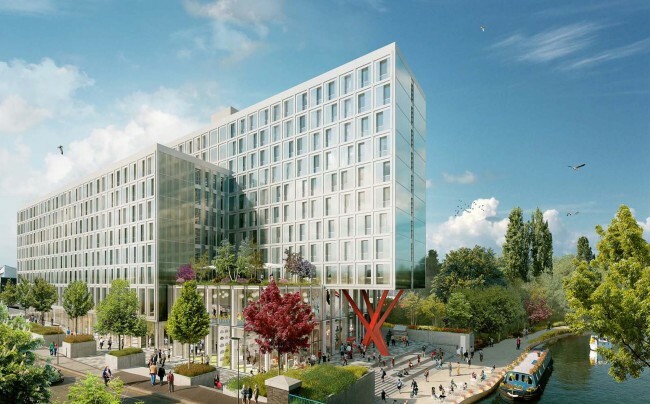 The Old Oak building, situated on a canal bank in north west London, opened in the spring of 2016, and has become a pioneer of “co-living”, a concept that is beginning to catch on elsewhere, notably in the United States. “Today in cities, we don‘t know our neighbours, housing is more and more expensive, we’re living behind our devices and this is addressing that challenge,” said Ryan Fix, consultant at The Collective, the project‘s developer. “You‘ve got a nice spacious room with big window that lets lots of light in,” he says as he shows AFP a room measuring 12 square metres (129 square feet). The Old Oak boasts high-end facilities such as a spa, gym, library, work room, restaurant and even a cinema, which is packed for evening showings of the hit TV series “Game of Thrones”. The building is a ten-minute walk from two London Underground stations. And its distinguishing features include its industrial-style architecture and sprawling common spaces filled with colourful armchairs and wooden furniture. 22 and 35 earning an average of ?30,000 a year ($40,000, 34,000 euros) -- who might otherwise be sharing a cramped house with strangers. It is common for Londoners to spend “40 to 50 percent of their net salary” on housing, James Mannix, a partner at estate agency Knight Frank, told AFP. “It is extremely difficult to find a place to rent in London and young people are increasingly marginalised,” said The Collective‘s Ed Thomas. “I’ve not only made friends, but I‘ve also done a lot of networking, so I’ve met lot of people that I now work with as well,” he told AFP. Sarah Sinigaglia, a 19-year-old Italian-Swiss student newly arrived in London, agreed. Estate agent Mannix said the concept of co-living is “socially a good thing,” creating affordable accommodation -- at the same time profitable for the developers -- in a private-sector response to a crisis which the public authorities are failing to tackle sufficiently.